It was brought to my attention last week, by D’Andrea that some of the etsy team was making a trip to Toronto and Montreal to meet up with Canadian etsy sellers to talk about their future plans for etsy and to get feedback from them in person. They didn’t have a set location for Toronto, so I was more than delighted to offer up the workroom as a meeting point. Just under fifty people showed up for the meeting Friday night and somehow I had wrangled just about enough chairs and stools for everyone. Chad, Sara and Liz were the enthusiastic etsy representatives who came to meet with us. Not surprising they had some flight delays with Air Canada, but everybody just mingled and introduced themselves as we waited for them to show up. I’m not an etsy seller, yet. But, it’s something I’ve really been thinking about for a while. (I’ve also been wondering if I should start twittering?) So, the meeting was really interesting for me to hear about some of the features that etsy is focusing on improving such as better search engines (such as being able to search local AND with key words), clearly stating that prices are listed in USD, being able to rearrange the items in your shop, and easy currency conversion. The attending etsy sellers each introduced themselves by real name and etsy shop name and gave really great feedback. It was fun putting faces to products and when many people introduced themselves there were shout outs of ‘Hey, I love your stuff!’. Things like having the option for local pickup, support for coupons or gift certificates, batch editing of listed items, being able to change your etsy name (especially when you chose the name ages ago without thinking that it might be a future shop name), and better support and tools for the street teams were brought up with group consensus. There were lots of great ideas bounced around for creating applications that would allow bloggers and sellers to promote their favourite etsy items or shops easily. There is a hope that developers will begin to create these tools outside of etsy, similar to facebook or the iphone. A brief discussion was also held concerning creating a wholesale platform that would assist potential retail buyers to find and interact with etsy sellers. This could potentially help sellers move to the next step with their business of doing bigger volume. It’s clear that etsy is a huge and dynamic community and it was impressive to meet some of the people from etsy headquarters and to hear how dedicated and excited they are about the future of etsy. I can’t wait to see the changes that come about in the next little while. Were you at the meeting? Did anything stand out for you? Does anyone else have points about etsy they think need improvement? Local etsy sellers are having an event at the Gladstone Hotel on Saturday May 16, 11am – 4pm. Drop by the ‘A Spring Handmade Market’ event to shop local etsy in person! Oh, I really would have liked to have attended. It sounds like there was a wonderful turnout! Thanks for this great summary of the event! I’m not a seller (yet) and I would have loved to attend, but my father-in-law’s retirement dinner (obviously) trumped it. It sounds like they’ve got some great ideas for future development of the site, which is exciting. Love the idea for local pick-up! It was awesome! Thank you so much for hosting it! What a fantastic spot you have down there. I volunteer at the Community Bicycle Network, which has a similar come-in-and-work setup (with tools for fixing bikes, instead of sewing machines), and my brother has just moved to Vancouver and wants to start up a workspace for jewelers. I love the whole concept. I strongly advise twittering. The oracle of Google Analytics tells me I get a lot of traffic from it. Too bad I showed up late! It was very informative, however, and I love your space. Glad you had such great time. 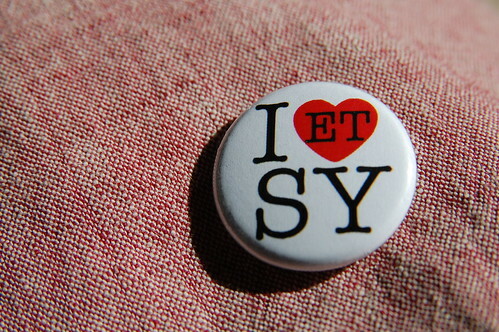 I was at the Etsy meeting in Paris not too long ago and likewise, it was also as inspiring! I was so pumped after leaving this meeting! It was super nice to meet lots of people in person that I had only known through the internet, like Minouette, and Dothandmade, and to reconnect with others like AnatomyofaSkirt. It was also really refreshing to hear the Etsy admin seem genuinely interested in how they could change their site to improve the buyer and seller’s experience. 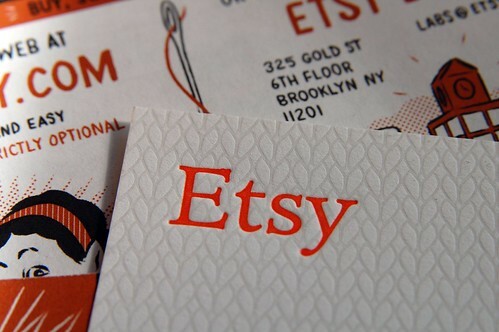 They seem really committed to keeping etsy a market for handmade goods, as opposed to a market for the mass-produced. YAY! oh, and don’t you just loooove Liz’s business card? I love feeling the letterpress embossing. get on twitter! It can seem daunting trying to figure out just what to do with it, but the more you use it, the more useful it becomes. Oh I would love to follow you on Twitter! I really wish I had been aware of this get-together I would have surely attended. I have never been to your little Co-op and would love to come and see it one day. Here’s hoping to some of the changes that were preposed and perhaps there could be another group meeting. I couldn’t make the getogether although I was super-excited to hear that it was going to be held at the workroom! I can’t wait to hear what those who attended thought about it. I started selling on Etsy under a year ago and it’s been a great experience, but yes, there are some things (mentioned in your post) that would make it even better for Canadians! Thanks for hosting Karyn. It was great to meet so many local Etsy sellers. Thanks as well for the post about A Spring Handmade Market. I can’t wait for it all to come together next week. First of all, what a great concept – “the workroom”. I wish this existed when I couldn’t afford a studio let alone a sewing machine. You are motivating creating people out there to discover what they can do with their hands. Next time in Toronto, I’ll be sure to check it out. Second, thanks for the write-up. I was curious to know how the Toronto-meeting went, having lived there before for 6 years. I am looking for one from the Montreal side. Does anyone know where I can find one? Looks like I missed the boat on this one. It sounded like a fun evening.